Charlie caught in the act — stealing kibble from Lexie’s bowl. We told Charlie, “No cat food for you! One year!” Clearly he didn’t get the “Seinfeld” reference. He still sneaks and nibbles. If he’s not taking Pink’s cat food, Charlie will grab a mouthful of Lexie’s kibble. This pushes Lexie to the puppy chow. And Pink has been spotted gobbling out of Lex’s bowl. Quite simply, feeding time in our house has turned into food wars. Charlie came with a yummy bag of puppy kibble, and instantly turned his nose at it. He’s much more interested in the food that isn’t his. 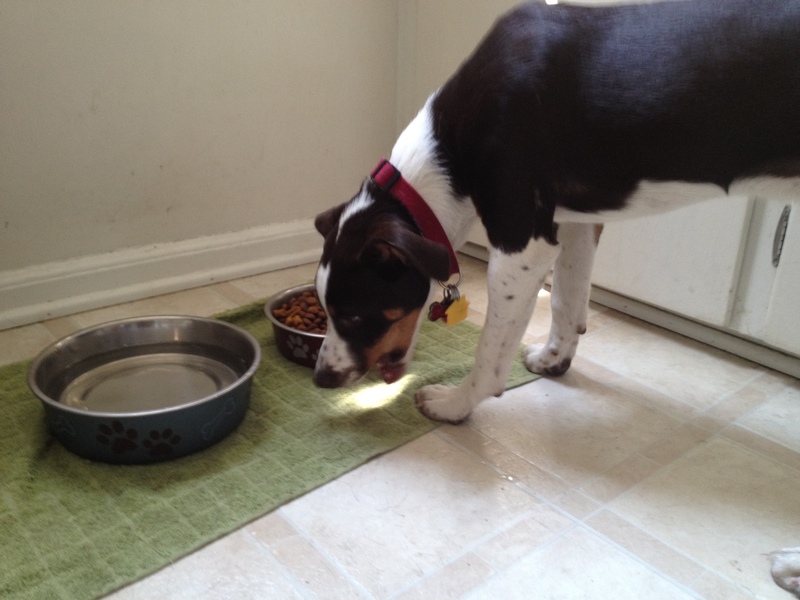 Lexie’s run-of-the-mill dog food is gold to him. Pink’s kibble is divine. Her wet fishy-smelling cat food? Charlie is over the moon. All the while, his puppy chow sits untouched. The finest puppy kibble couldn’t lure Charlie to his bowl. So we went out and bought some Eukanuba puppy chow. It didn’t take long before he was sneaking over to Lexie’s bowl and grabbing a mouthful. Lexie seemed unimpressed, and nibbled at Charlie’s food, wondering what the big deal was all about. Matt hatched the plan. He grabbed a cardboard box that already had an entry spot and an open top. 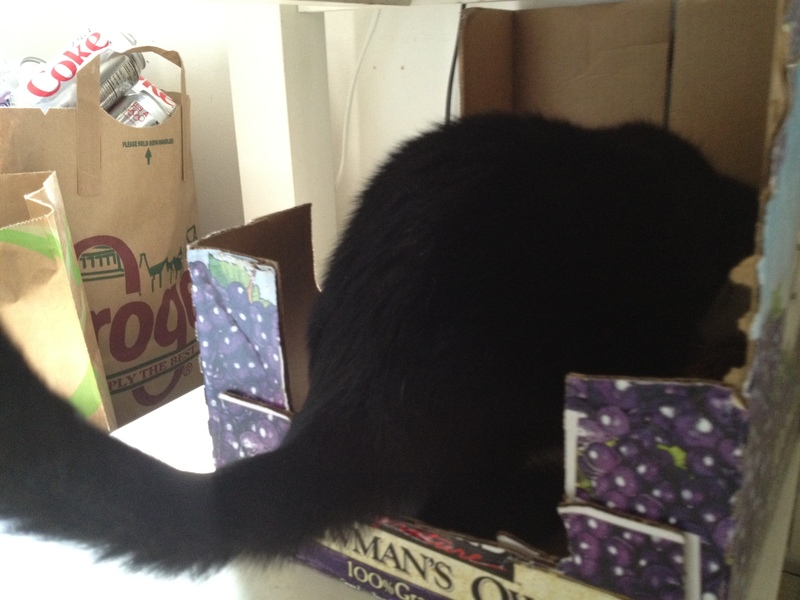 We put Pink’s food in the box, and she could climb in, with protection on three sides. This seemed to work, until Pink followed a floating fuzzball into the front room, leaving the kibble open for the taking. Charlie and Lexie were eager to munch. Realizing I had to do something, I took on a new persona: Jillian the lunchlady. I’d like to think I’m a bit cuter than the school marms at my alma mater Field Elementary, but I held firm to their discipline. The approach was simple: Put treats in each pet’s bowls to lure them there, then stand in the middle to monitor as they ate. Hopefully from their own bowls. Pink prefers to dine at a Paul Newman establishment. Lex and Charlie prefer to eat her leftovers. Honestly, Lex always has been a self-regulating dog when it comes to her food. So getting her to eat on command was more of a wish than a command. Surprisingly, the organic blueberry treats (!) were a hit, and she lingered to eat some of her kibble, as well. Charlie powered through his treats, and ate most of his puppy chow. Pink was extraordinarily interested in her food for about a minute, then retreated back to the tree. Of course, Charlie made a beeline for her bowl. He stopped in his tracks. And went back to his bowl. 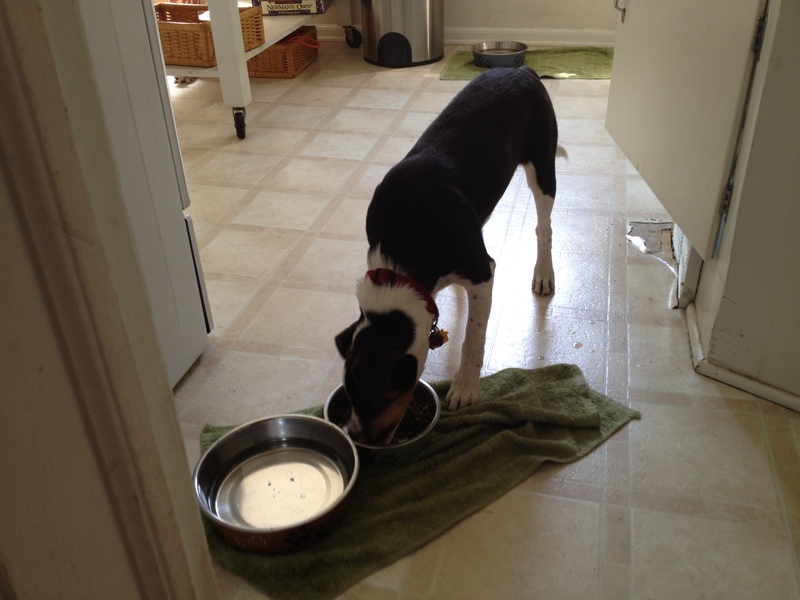 A rare surveillance photo of Charlie eating from his actual bowl. Thinking things were under control, I went to the front room to watch some television. 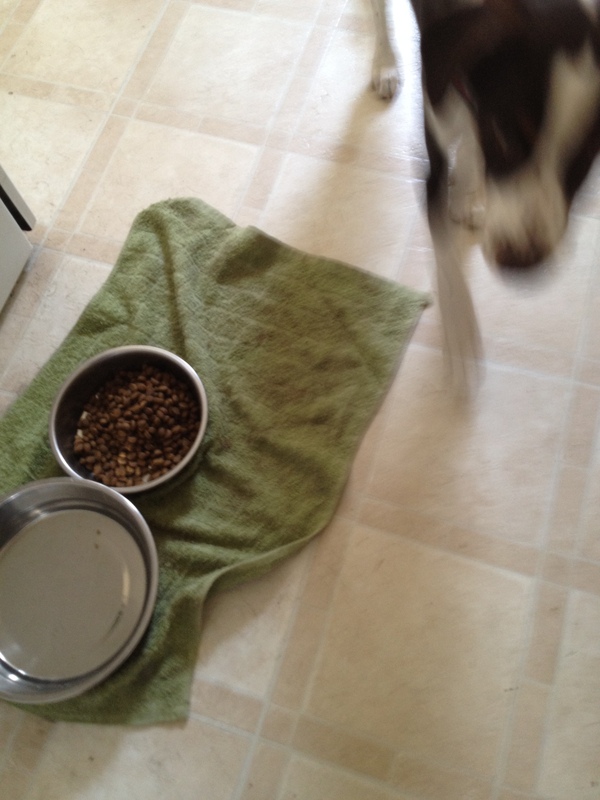 A few minutes later, Charlie rushed in, and spilled a mouthful of Lexie’s kibble at my feet. Clearly we’re not close to an armistice in this food war. As we’re finding with our puppy training efforts, these things take time. This entry was posted in Woof! and tagged adopt, animal rescue, border collie, cat, dog, dog food, elementary school, puppy, Seinfeld by ourfureverfamily. Bookmark the permalink. Oh boy! My only fight at home is keeping Doggy away from the trash can, he seems to love it, I leave his bag of food open, he would disregard that and go for the trash. Patient is key and so scarce in my case. Haha. The trash can proved to be an issue with my elderly dog, Lex. I finally got her to leave this one alone by watching like a hawk. As for food, both dogs are grazers, which makes it difficult to police. Sigh. Yesterday was a good day, so I’m hopeful! My dog has become the stealth robber of note, always finding new ways to steal the cat food. It’s irresistable to her. Agreed. I find it a bit funny when the cat nibbles on such a large dog food nugget. Sigh. We’ll get this straightened out eventually!